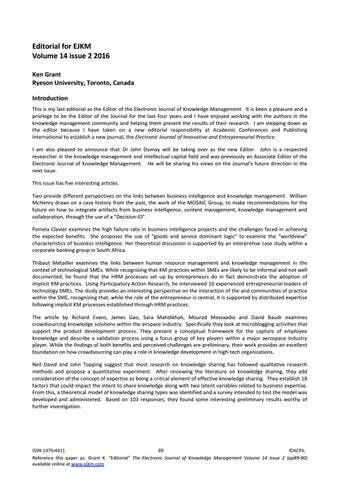 Editorial for EJKM Volume 14 issue 2 2016 Ken Grant Ryeson University, Toronto, Canada Introduction This is my last editorial as the Editor of the Electronic Journal of Knowledge Management. It is been a pleasure and a privilege to be the Editor of the Journal for the last four years and I have enjoyed working with the authors in the knowledge management community and helping them present the results of their research. 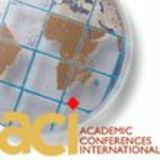 I am stepping down as the editor because I have taken on a new editorial responsibility at Academic Conferences and Publishing International to establish a new journal, the Electronic Journal of Innovative and Entrepreneurial Practice. I am also pleased to announce that Dr John Dumay will be taking over as the new Editor. John is a respected researcher in the knowledge management and intellectual capital field and was previously an Associate Editor of the Electronic Journal of Knowledge Management. He will be sharing his views on the Journal's future direction in the next issue. This issue has five interesting articles. Two provide different perspectives on the links between business intelligence and knowledge management. William McHenry draws on a case history from the past, the work of the MOSAIC Group, to make recommendations for the future on how to integrate artifacts from business intelligence, content management, knowledge management and collaboration, through the use of a "Decision-ID". Pamela Clavier examines the high failure rate in business intelligence projects and the challenges faced in achieving the expected benefits. She proposes the use of "goods and service dominant logic" to examine the “worldview” characteristics of business intelligence. Her theoretical discussion is supported by an interpretive case study within a corporate banking group in South Africa. Thibaut Métailler examines the links between human resource management and knowledge management in the context of technological SMEs. While recognising that KM practices within SMEs are likely to be informal and not well documented, he found that the HRM processes set up by entrepreneurs do in fact demonstrate the adoption of implicit KM practices. Using Participatory Action Research, he interviewed 10 experienced entrepreneurial leaders of technology SMEs. The study provides an interesting perspective on the interaction of the and communities of practice within the SME, recognizing that, while the role of the entrepreneur is central, it is supported by distributed expertise following implicit KM processes established through HRM practices. The article by Richard Evans, James Gao, Sara Mahdikhah, Mourad Messaadia and David Baudr examines crowdsourcing knowledge solutions within the airspace industry. Specifically they look at microblogging activities that support the product development process. They present a conceptual framework for the capture of employee knowledge and describe a validation process using a focus group of key players within a major aerospace industry player. While the findings of both benefits and perceived challenges are preliminary, their work provides an excellent foundation on how crowdsourcing can play a role in knowledge development in high-tech organizations. Neil David and John Topping suggest that most research on knowledge sharing has followed qualitative research methods and propose a quantitative experiment. After reviewing the literature on knowledge sharing, they add consideration of the concept of expertise as being a critical element of effective knowledge sharing. They establish 18 factors that could impact the intent to share knowledge along with two latent variables related to business expertise. From this, a theoretical model of knowledge sharing types was identified and a survey intended to test the model was developed and administered. Based on 103 responses, they found some interesting preliminary results worthy of further investigation.